For those who like to engage in adventure sports, then there are a variety of options for you. Be it the different stretches of white water Rafting, a Kayaking lesson, Angling, Rock climbing, Mountain Biking or Body surfing, each of which provides for thrill and excitement. Village Walks and short nature treks along the scenic surroundings, an exciting late night leopard walk, or a heady shower under a nearby pristine waterfall are for those of you who would like to take it easy. In-house activities like Volleyball, Badminton, a round of Carom or Chess takes one back to the days before internet. We have provided a large number of board games for you to engage in some fun moments. There are a variety of books and reading material available for all ages meant to give you some time to yourself. The serene morning invites you to practice your Yoga/meditation and the evening bonfire is a perfect end to the day. If you’d like, we can pre-plan a customized holiday for you to make the most of your visit here! 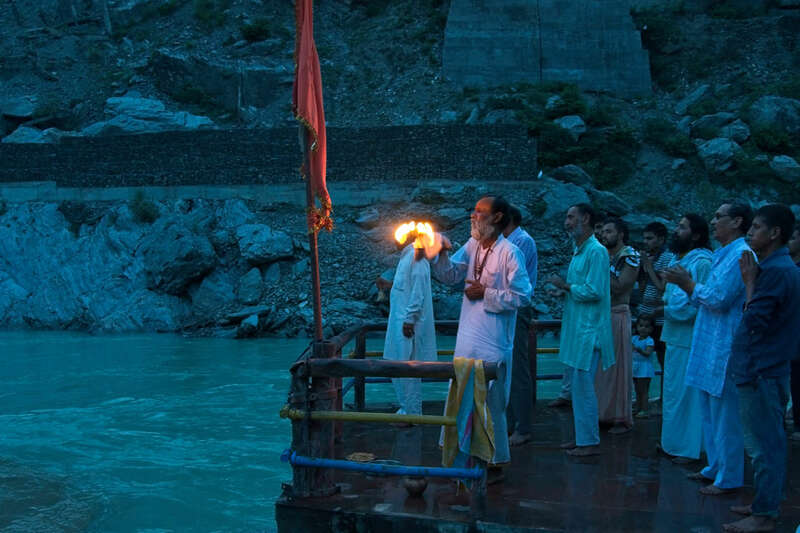 The mighty Ganga is one of India’s major and holiest of rivers. With a location close to Delhi, it is also the hub of white-water rafting which combines an action-packed trip with the best rapids, float sections and wilderness. 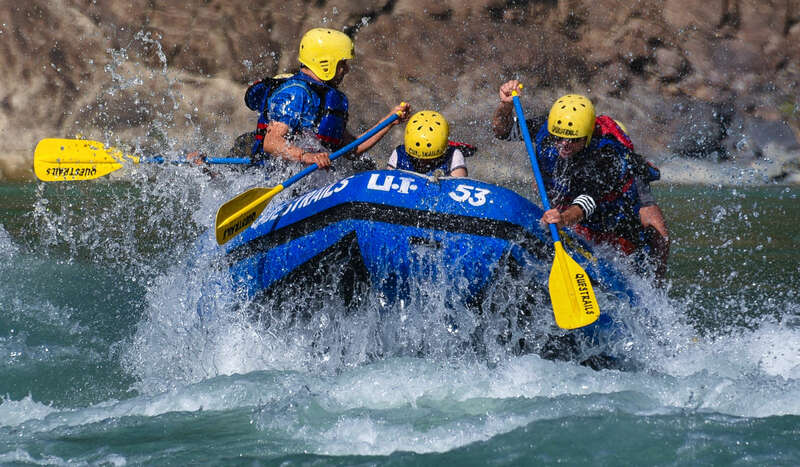 A perfect introduction to white-water rafting and an ideal weekend getaway to calm overworked nerves, it is a popular choice for first-timers, non-swimmers and families. 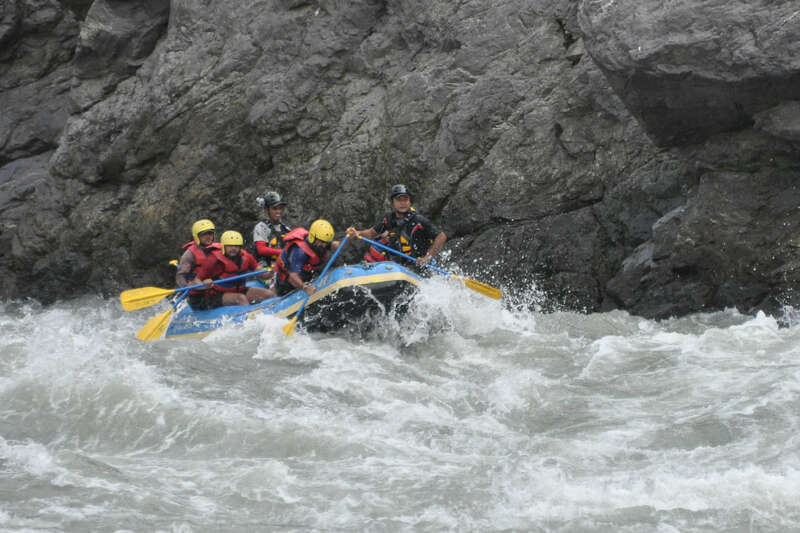 The upper valley tributaries of the Ganga, the Alaknanda and the Bhagirathi are reasonable expedition level rivers and have been host to many great white water paddlers from all over the world. Welcome to the Ganga. We begin this scenic rafting trip below the confluence of Alaknanda and Bhagirathi at Devprayag and onto the actual Ganga. It is a mild section from here to Vyas Ghat and a great introduction to white water rafting for beginners and non-swimmers, as well as kids. You will be passing through beautiful gorges and can float or body surf in the invigorating waters, whilst catching a glimpse of the birds in this area. Rafting time is approximately 1.5 hours to Vyasghat. It’s a 28Km beautiful stretch away from the crowd and a good class III+ section. This full day activity starts from 8.30 am up to 3.00 pm. We have to drive to Bhagwan after crossing Devprayag on the Badrinath road, 15Km short of Srinagar. The trip starts on the Alaknanda as it enters the last canyon stretch with good white water, with names of rapids such as “Bhagwan’s Pillow”, “The Deadly Duos” and more. After a Picnic Lunch at Devprayag, the confluence of Alaknanda and Bhagirathi River, we continue to raft down to Vyasghat and put out from the river at the resort. Listen to your guide carefully; it will come in handy during the day. Rafting time is approximately 5 hours to Vyasghat. This section involves classy white water, long float stretches, beautiful gorges and a confluence. This full day activity starts from 8.30 am up to 3.00 pm. 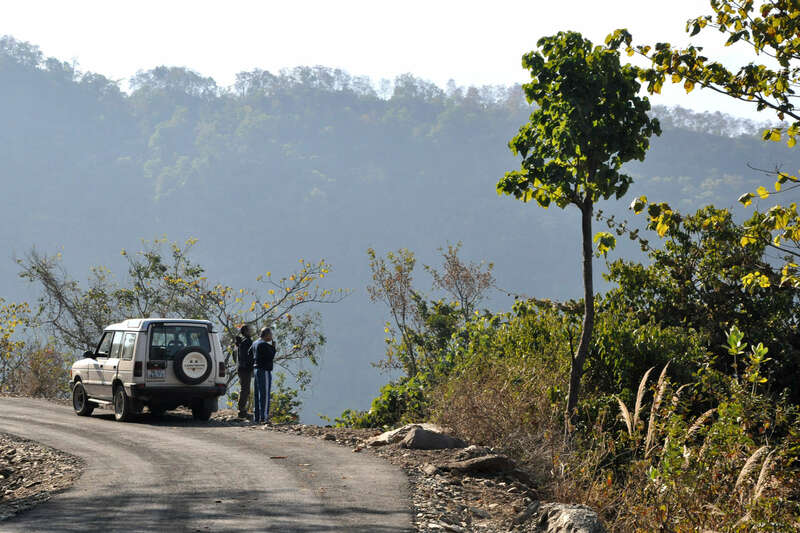 We start early and drive 35Km for 1.5 hrs from our resort to Koteshwar Dam – the put-in point. The water levels are controlled by the dam and water is released daily at particular time. At low water Bhagirathi is a technical river requiring a lot of swift moves on the raft but when the water level is high it offers some amazing white water. The major grade 4 rapids long this section are ‘Elephant Rock’, ‘Shoot’ and ‘Confluence’. We assure you that at least one of these rapids will leave you shaken. A picnic Lunch will be provided on route. Rafting time is approximately 4-5 hours to Vyasghat. Nature and Village walks are at the heart of any Questrails Experience, allowing you a glimpse of rural living in remote mountain regions and the vast range of vegetation specific to the area. We can arrange visits to local schools, temples and markets enabling you to get a full understanding of the culture, its people, religion and customs. Our walks are the perfect antidote to the frenetic world that most of us live in. The sport of rock Climbing aims to reach the summit or end point through free-climbing using your own strength, with or without rope. Rappelling is a controlled descent down a rock face with the use of ropes. Whether you are a novice or a pro, our trained and qualified expert will guide you through this enjoyable sport, where you will learn to increase your fitness and strength whilst pushing your boundaries. The Himalayan Golden Mahseer has always been regarded as one of the ultimate challenges for serious anglers across the world. But, as any angler will tell you, the Mahseer is no easy game, it’s a serious test of an angler’s skill and perseverance. Often, you need to fall back on the experience of old hands who know these rivers like the back of their hand and are familiar with the guiles of this wily creature. Kayaking is a low impact, outdoor sport that can improve your sense of balance, strength and flexibility. Our instructors create a welcoming environment for all participants regardless of age, ability or skill. Beginners will be introduced to correct paddling techniques, navigation and safety on the river. Banyan by the Ganges offers mountain biking experience with easy to moderate difficulty level. It’s fun and exciting, yet nerve-wracking and terrifying all at the same time. The cycling routes out here have very less traffic, and pass through small villages and forests. Logistics assistance is provided by a support vehicle and experienced Trip Leader. Practice your daily Yoga and Meditation under the Banyan tree calmed by the soothing energy of the river. Rebalance your body and mind, connect with your spirit and align yourself back to perfect harmony. Dandanagraja, a Vishnu temple is a 1.5 hr drive from the resort at a distance of 32 kms. On a clear day you can see the mesmerizing view of snow capped peaks surrounding the mountain top. A scenic drive through the protected Advani forests towards Pauri (60 kms), takes 2 hrs and is a good option for those who have the time. A stop over at any one of the beautiful spots en-route with a personalised Picnic basket will add to the experience. Photography at Banyan by the Ganges! From the river, mountains, people, villages, animals and birds… there’s a lot to excite and interest a photographer, both amateur as well as professional. So bring your DSLR, the new mirrorless cameras, or your mobile phone and click away. We are world travellers and rate our experience of Banyan by the Ganges highly. What appealed most to us was the soothing serenity of the place. And when we wanted some excitement, we went rafting. Rapids were exciting and the body surfing heavenly. Imagine yourself floating in the river with mountain walls rising high on both sides! Must mention that the rafting outfit was professional and we never felt threatened. We enjoyed walks on the old Char Dham pilgrimage route and were rewarded with the sight of three Yellow Throated Martins coming down the hill. Away from all connectivity, you connect deeply with yourself and nature. Awesome staff – they take care of every little need of yours – impeccable attention to detail…You have truly awesome guides for water sports – white water rafting and kayaking, also for local treks and rock climbing; People who know the lay of the land and river and care about your well being. For the kids – there is no TV, no mobile network, but loads of fun activities like building castles on the beach and a great collection of books for all ages of children. There’s also an open badminton and volleyball court. A variety of board games and a couple of resident dogs complete the entertainment package. There are a couple of villages within a vicinity of a few km’s and would provide interesting hiking options if you are so inclined. The food, the staff and the location are all 5 star! Special thanks to Deepak who caters to all outdoor activities with soooo much zest and enthusiasm! We went fishing, body surfing, trekking, kayaking and cliff jumping! It was truly a divine experience. Our 9 year old did not have a dull second here despite being a complete urban lad! Stayed there in May and had a great time. Location is great. Warm hospitality was the highlight…Rafting was fun, kayaking was a wonderful experience, did twice, worth especially if you don’t want to get lost in the Rishikesh crowd. Talking about things to do – There’s Vyas Ghat and Vyas Temple at walking distance for a lovely serene evening walk. There’re two lovely waterfalls – one behind the resort near the ghat, it’s a little private waterfall. The other one is more big and spacious for family and kids. One can take treks for local village Naun-Gaon opposite BTG (approx 30- 40 min) the views were to die for, we saw the local village life, interacted with people, had tea with them, saw their farming! Also one can take night strolls with their cars and can spot a deer or if lucky even a leopard! 🙂 And last but not the least – just lie down under the beautiful sky with thousands of twinkling stars above and hear poignant sound of Ganga!